‘The night is fine,’ the Walrus said. ‘Do you admire the view? 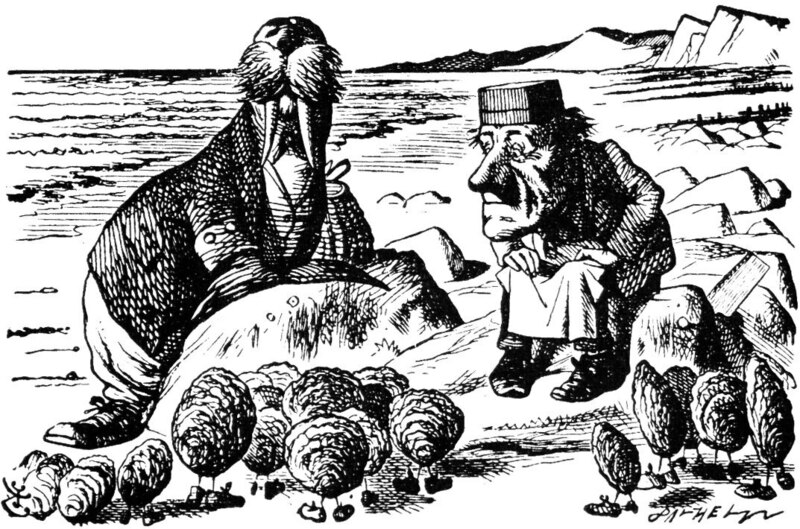 Carroll’s deeply sadistic poem must have struck a chord in my young mind as the cruel facts finally dawned on me as well as on the ‘eager’ little oysters, prompting ‘sobs and tears’ from the Walrus as he sorts out the largest molluscs before scoffing them. But we are not told if he did in fact ‘scoff’ them. Perhaps he preferred to let them just slither into his mouth with a contented hum of satisfaction. There is a powerful ellipse here: the accompaniments of the meal (bread, butter, pepper and vinegar) are listed, but there is no description of the actual consumption – except as a kind of ghost image, contained in the punchline ‘But answer came there none’. Pistol: Why then the world’s mine oyster, Which I with sword will open. But the word ‘oyster’ has other associations. Because of its shape – and no doubt because of its delicacy – it also refers to two small pieces of dark meat that lie on either side of a chicken’s backbone. Arguably the best part of the chicken, these tender bits are frequently referred to as the chef’s reward for cooking. Jean-Pierre Jeunet’s whimsical film, Amelie (Le Fabuleux destin d’Amélie Poulain, 2001), is an endearingly digressive farrago of disparate facts, myths, irrelevancies and absurdities worthy of The Walrus and the Carpenter itself. It also proved to be a worldwide hit, despite being lambasted by a handful of Cahiers du cinéma critics, who dismissed it as a chocolate-box portrayal of Paris. In the film the heroine Amélie, played by the pert Audrey Tautou, sets out to try and improve the lives of people around her by ‘interfering’ with their experiences. This she does repeatedly. To take just one example, after discovering a small tin box containing a child’s toys hidden behind a skirting board, she eventually tracks down its now middle-aged and depressive owner, Dominique Bretodeau. After planting the box in a telephone booth, she ‘engineers’ his discovery of it. This so delights Bretodeau that he resolves to recontact his abandoned daughter, whom he has not seen for many years. In an earlier scene, we learn that Bretodeau’s great obsession in life is with chicken ‘oysters’: whenever he carves a roast chicken he first removes the bird’s breast, legs and wings, then triumphantly homes in on the ‘oysters’, devouring them with his fingers. In a brief epilogue to the movie, after his change of heart about his daughter, he again carves a chicken, but this time unselfishly breaks an ‘oyster’ in two and shares it with a little boy (an echo of the tin box’s original owner). As you’ll discover when you see the movie, the ‘oysters’ in question go under a different name in French, which has nothing to do with shellfish: they are called le sot l’y laisse (‘the fool leaves it there’). Inattentive carvers often overlook the treasure nestling under the chicken’s legs. This is not the case with certain upmarket restaurants, including Heston Blumenthal’s Dinner in London, which recently featured a delicious ragoût of sot l’y laisse on its menu. Another curious fact is the connection between the oyster (the bivalve) and the Ancient Greek word for ostracisation, or temporary banishment of a citizen. Ostracisation took the form of a name inscribed on a potsherd, a word related to an oyster shell, or ostreion. So here we are, back in an etymological hall of mirrors not all that remote from Amelie. George Cole, was last surviving cast member of Henry V 1944 (played The Boy) went on to play Flash Harry in St Trinian's films of the 60's, then on to play an older crooked car dealer called Arfer Daley on long running TV series Minder. His endless malapropisms included, after his minder got punched: "Don't you worry my son, from now on the world is your lobster." It’s masc., and fem., and even neuter. Am I husband, wife or chum? Ogden Nash’s lines on the oyster have a rather more topical flavour than Lewis Carroll’s. They are quoted in Robert Neild’s entertaining “The English, the French and the Oyster” (1995), which sheds light on two countries’ contrasting approaches to economic management via a study of their treatment of oyster production. A must-read for oyster lovers in these brexiteering times.